The Circus Obstacle Challenge combo inflatable play structure brings all of the action of a three-ring circus, sure to entertain attendees of all ages under the big top. Young ring masters and circus performers will be drawn to this inflatable play structure's endless combination of activities, including a large jump and plenty of squeeze throughs and pop ups! 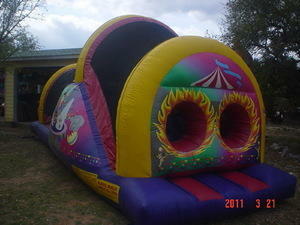 This fantastic inflatable play structure has a Circus Slide Challenge for one amazing, fun-filled unit. Colorful artwork displays many recognizable circus performances, including an entrance through rings of fire! The inflatable play structure begins with a front-loading obstacle entrance, taking participants through climb and slide to facilitate maneuvering skills and build confidence. The challenge obstacle then leads to an exciting crawl through obstactle to exit, all to guarantee hours of enjoyable physical activity. Each inflatable play structure has mesh windows for easy viewing, and is constructed of the fire-resistant, lite n' strong™ vinyl for easy portability, durability and safety.